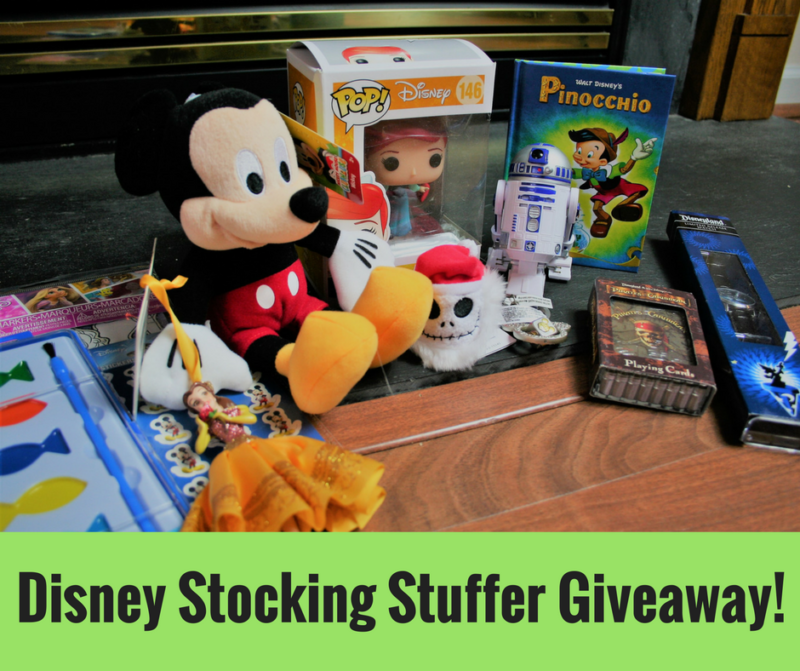 Stocking Stuffer Giveaway by Disney in Your Day! Hello everyone! My friend Becky is the creator of the website Disney in Your Day, and she has got a great giveaway for you! 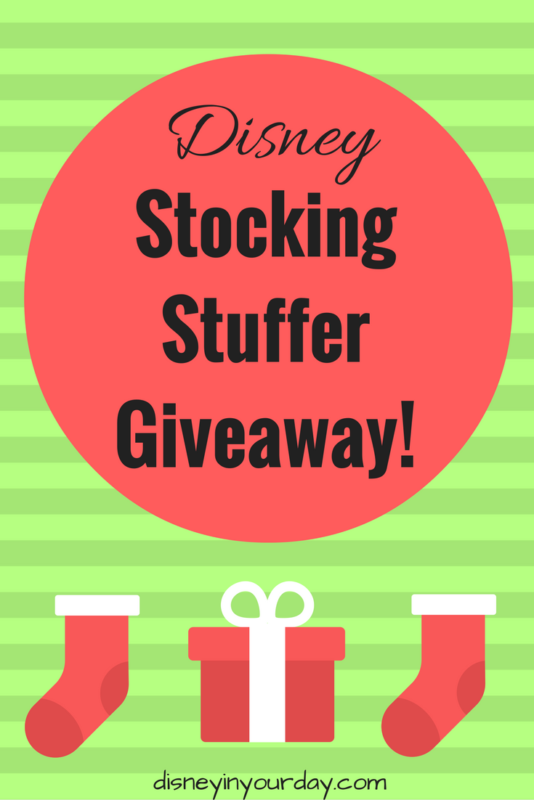 Becky is giving away a stocking stuffer full of great Disney goodies, and it could be yours for the taking if you are the lucky winner! If you like Disney, and you like giveaways, then this is a win-win for you! Take a look at the picture below to get an idea on what you’ll receive if you win. Disney Store Sketchbook Ornament – ornaments are a great stocking stuffer for all ages, and the Disney Store has some of the best ones! Art supplies – whether it’s a kid who likes to create or an adult who scrapbooks, there are lots of Disney-related art goodies. This stocking has stickers, coloring sheets, and a Finding Dory watercolor paint set! Tsum tsums – these stackable plushes are hugely popular right now with kids and adults. They are inexpensive and fun so perfect for a stocking! You can get the newest ones at the Disney Store and some of the older ones at Target. POP Vinyl – lots of people collect these, and even if you don’t it’s still fun to have one or two! An Ariel one is included in this giveaway. Star Wars toys – for Star Wars fans there are lots of fun little goodies. I’ve included an R2-D2 toy in this stocking. Playing cards – another easy thing to throw in a stocking, I’ve got Pirates of the Caribbean cards. Keychain – A great theme park souvenir is a keychain, and they’re small enough to fit in a stocking! Watch – if you like to include something a little more upscale in your stockings, consider a Disney watch. Kohl’s is a great place to find them, but the one I’m giving away is from Disneyland! Plush – small plushes are great for stockings and I love how it looks with them just peeking out of the stocking on Christmas morning! With a stocking stuffer prize like that, your Christmas shopping for your little one — or maybe for yourself? — would be all done! I have it from Becky that everything you see in that picture is included in the prize! So what’s next you ask? Well, how about entering? You can do so using the Rafflecopter entries below, or you can go to Becky’s site at Disney in Your Day to enter there — either way, it’s the same code so the same giveaway! Good luck! Post written by Mike Ellis. Disney’s The Jungle Book. A Classic movie originally released October 18, 1967, and a live featured film released April 4, 2016 (at the El Capitan Theater) and April 15, 2016 (everywhere else). The movies are incredible in their own right, but today’s post is about a new book that I received a copy of to review. Further on, I’ll also provide details about a giveaway that you can enter to win your own copy of this incredible book. For that’s exactly what it is — and absolutely incredible book! This coffee table style book, measuring 10″ x 11″, and containing 156 incredible pages, is the perfect addition for any Disney enthusiast! What follows in these pages is a journey — a journey of discovery that delves into many of the aspects of what the Jungle Book movies are all about. The book is divided into the following chapters, which take the reader along the journey into what it takes to create a movie of this magnitude. 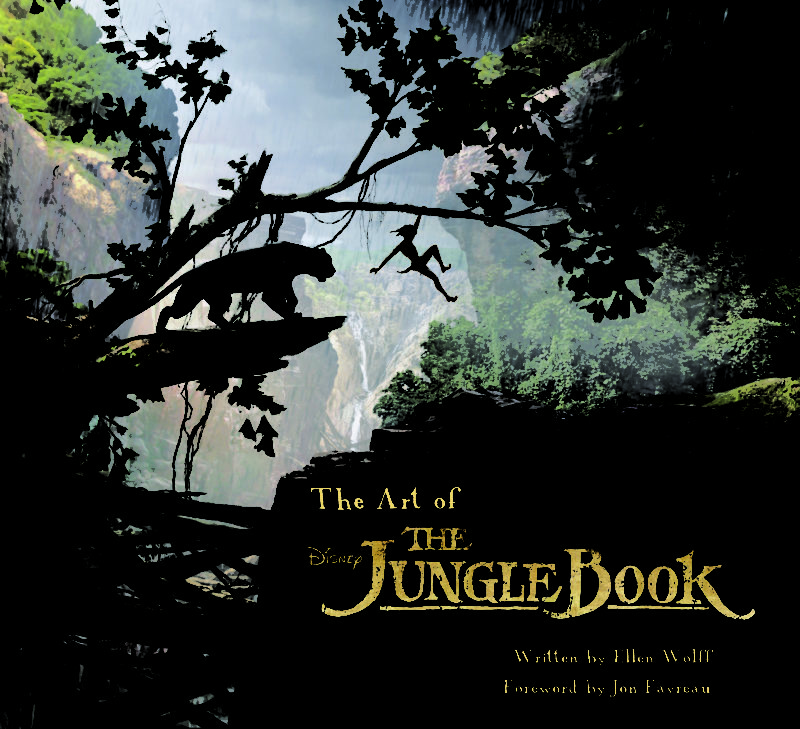 The beauty of this book isn’t in just the artwork that is depicted in it’s incredible pages; the beauty extends beyond that, and shows us the thousands of details that director Jon Favreau goes into in creating the Jungle Book movie. It’s not just a recreation of the original story of the Rudyard Kipling’s novel; it’s a detailed and inspiring look at the role that actors, technology, and vision play in creating what may be the best version of this movie yet. I think for me what I like best about the behind the scenes look at the movie is the incredible thought process that each of the actors takes in learning their role. For example, actress Lupita Nyong’o, who portrays Raksha in the movie, prepared for her first ever voice-over role by studying the behavior of wolves and learning how their social hierarchy works. For Christopher Walken, the man behind King Louie, he appreciated the role so much that he likened the process as less about making a movie and more about making music. Those are just two examples are of what makes this movie special in my eyes. Binding it all together though is the directorial genius of Jon Favreau. This director knew what he wanted in the film, and searched long and hard to find the exact pieces to complete his puzzle. For example, the actor who plays the role of Mowgli, Neel Sethi, was discovered among hundreds of auditions in cities across the country. At only ten years old, this was Neel Sethi’s first movie, and the role he played was perfect. If you are interested in acquiring your own copy of this book, you may visit the Insight Editions or Amazon websites (list price $45.00); however, My Dreams of Disney has been selected to give away a copy of the book! To enter to win, subscribe to the Insight Editions mailing list by clicking the link. The link will be active from today, June 15, 2016, until 11:59PM on Friday, July 1, 2016. After that time, Insight Editions will select a winner from those that entered. Good luck! 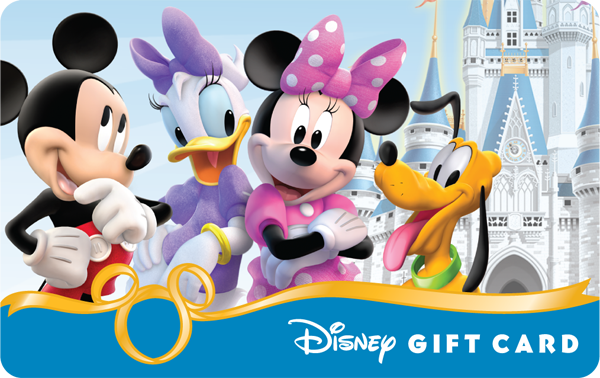 Prize: (1) $100 Disney Gift Card! Entry Opportunities: Visiting Brenda Kenworthy – Pixie Vacations‘ Facebook Page, Sharing the giveaway from the original blog post (once per day), leaving a blog post comment, following Brenda on Twitter, Tweeting about the giveaway (once per day), and a free entry for supplying your email address. There are many opportunities for you to enter to win, so go to it, and good luck! Remember, you have to submit your entries via the Rafflecopter widget, which is located on Brenda’s Mousenapped Post, on her Facebook Page under the Giveaway tab, and also in this blog post. The winner will be notified on Tuesday, April 5, 2016 via email, and will have 24 hours to claim their prize, so make sure you check your email often on that day! After the prize is awarded, an official notification will be announced on the Brenda’s Facebook page. So tell us — what would you use your gift card on? Follow the prompts in the Rafflecopter code and tell Brenda! Good luck! Jeff Chaves is back with a second edition to his excellent book, A Christian’s Guide to Walt Disney World Resort. Jeff is an ordained minister, and as a result, he has incorporated ways that you can enjoy your Disney vacation while not checking your faith at the door (or leaving it packed in your suitcase). I was privileged to be able to review his first edition of the book, which was available in a digital format only, and was pleased with being able to keep it on my phone and reference it. This edition is available in both a paperback or Kindle format, and the paperback version is small enough that it won’t be like trying to carry around the Unofficial guide in your pocket! 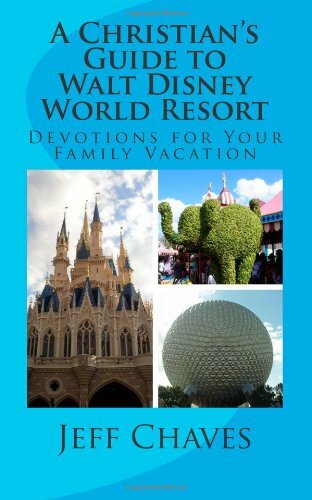 This book has so many incredible tidbits of information in it, all of which is designed to show you that, even though you are a family on your Walt Disney World vacation, that doesn’t mean that you need to stop, put your Faith and Christianity in a dresser drawer, and forget it until you get back home! Chaves does a great job of doing what so many of us forget to do when we are on vacation — getting us to slow down, examine the wonderful intricacies that is Walt Disney World, and gleaming the wonderful insites that Walt Disney and his Imagineers present to us, all while tying it into wonderful lessons from the Bible. God accepts anyone who turns to Him. ~ The story of the Prodigal Son. This devotion struck me because I, like so many of us, was once that lost son. I did my own thing, I didn’t follow God, for much of my life I didn’t even go to church. That has all changed now, but I remember who I was before I found and accepted Jesus into my life, and this devotional does a great job of reminding me that anyone, even a pirate, can still find God, that there is still time. Everyone must come to Jesus like a little child. I have always loved it’s a small world. I love the song, I love the different scenes, I love the final scene where everyone is gathered and bathed in white clothing. In his devotion for this attraction, Jeff reminds us of Jesus’ words about how we need to receive the Kingdom of God like children — because our children are full of innocence and belief, and far too often when we get older we lose that innocence. A Christian’s Guide to Walt Disney World Resort is a great read, and worth the $8.99 cost for the paperback (or $5.99 for the Kindle version). If you would like to purchase a copy, just head over to their Amazon page for more details. In addition, Jeff has given us an extra copy to give away! To enter, just complete the Rafflecopter information below, and good luck! Gluten Free & Dairy Free #Giveaway! Congratulations Sarah on your 5th Anniversary! My Dreams of Disney would like to take some time and with our friend and colleague, Sarah, the creator of the Gluten Free & Dairy Free at WDW site, a happy 5th Anniversary! Wow! The world of blogging is still a relatively new concept — at least to me, anyway — so the idea that Sarah and her site is now turning 5 years old is astonishing to me! Congratulations Sarah! I know that our blogs become a labor of love, and the fact that you are celebrating 5 years speaks volumes about how much you enjoy what you are doing with it! 2 $50 Disney Gift Cards to be awarded to two winners! 1 Special Diets Prize Packs to be awarded! That’s a total of 3 different winners! Good luck to each and every one of you. To enter, you have to enter using the Rafflecopter giveaway widget below. The giveaway will run from August 1st – August 31st, so you have a great opportunity to enter and get one of the winning entries! Best of luck to all of you!